The analysts of Canaccord Genuity have carried out a study in which they find that Apple and Samsung earned more than 100% profit from the mobile business. The reason of this outstanding earning or gaining profit is that most of other companies are included in the red. Apple is at the top to get the most of the profit, which they earned in Q 2 is 53 and it reaches to 56% in Q 3. 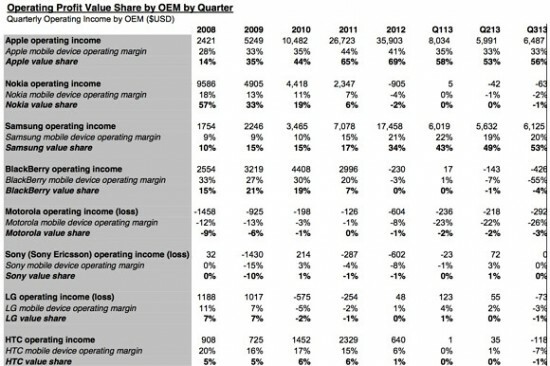 The profit of the Samsung mobile phones is also increased in Q 2 was 49% and reached to 53% in Q 3. The profit earned by Apple is more than the combine profit of Nokia, LG, Lenovo, Huawei, Samsung and Motorola. The company, which was not considered in the red was Sony as its profit runs from 1% to 0. During the Q 3, the profits of smart phone companies of HTC, Nokia and LG ranged from breakeven or zero to -1%, Motorola ranged from -2% to -3% and the highest hits of BlackBerry ranged from -1% to -4%. The calculations of all Chinese makers smart phone companies like Lenovo, Huawei and ZTE are not included. These companies are considered near the top 5 smart phone companies across the world. The numbers of the smart phone companies are varied as these are starting working in the mobile phone industry. Some Android vendors count their profits, which they take from the number of the handset and this point is not considered.